After looking around, you start walking on the faint light green path on the ground. You gaze around looking for the first place you want to learn about. You hear a greeting from the right, and you turn to see a smiling brown Ixi with a crown on her head! Why, this must be Shapeshifter! Sinsi welcomes you to her home and invites you over to a red and white checkered blanket and talks about the rules and just how much her friends love her games! On the blanket lay plenty of different shapes. All it takes to win is to get all the icons to be the same. For only twelve years old, it appears Sinsi is a very smart young Ixi. It has also been heard that you can gain an avatar by playing this game! Why not play a few games and see if you can get it? Doesn't hurt to try, right? After your done playing Shapeshifter, you look around to the next event you should go to. You notice a small pond and a group of Neopets lined up in a row. As you walk over on the green path, you notice that these villagers are kissing the Mortogs! You get the impression that this is Kiss the Mortog! After waiting in line for several minutes, waiting impatiently while Mortogs turn into princesses/princes (or watching them blow up) it's finally your turn. The Grundo welcomes you, and explains the rules. After words, he reaches out into the pond and takes two Mortogs and places them in front of you. All you have to do is just kiss it! (Or in your case, click it!) Sometimes the Mortog will turn into a princess, or you might end up with Mortog guts all over you – which you can promptly wash off in the nearby pond. Why not go ahead and try it? As you look around, you notice another group of Neopets on the bleachers across the road. You ponder why they are shouting names such as Stinky, Smelly, Poopy and others you can't make out yet. Why not investigate? As you get closer and stand within the middle of the two bleachers, you notice local Turdle's racing towards the centre of the circle This must be the Turdle Racing! Unfortunately for you, the Turdle Races have just ended. But, this will give us some time to research about this fantastic racing game. All you have to do is to go to the Betting Stand, make a bet of 1500 NP or lower and, as an option, you may feed the Turdle to help make it run faster. It only takes a mere few seconds for the race to be on, so go make your bets and good luck! After screaming just like the Techo Fan from the Altador Cup, you continue on with your journey. You seem quite exhausted, so you take seat by a rather, large. Oops! Whoa, watch where you’re sitting! You almost fell in a small hole! This must be the Symol Hole you've heard people talking about! You look straight into the deep, dark hole. Unfortunately, you cannot climb in because you're too big. But how do you explore it? After thinking for a few moments, you grab a nearby Whinny and gently guide it in the dark hole. After waiting a couple minutes, the poor Whinny comes out of a hole, with nothing. But occasionally Petpets do come out with a trinket or an avatar, so you never know when it will be your lucky break. Perhaps you should come again tomorrow? After sending the Whinny back off to the wild, you once again go on the path to explore a bit more of Meridell. You look around, trying to see something that will pique your interest. What do you see in the trees? You make your way over and climb through the trees, where you stumble upon a beautiful Earth Faerie and she welcomes you to Illusen's Glade! Illusen invites you down to a comfortable green blanket and offers you some Green Tea and Illusens Cream Cookies. After having a delicious snack break, you ask her why she is in Meridell and not Faerieland. She mentions she loves being closer to the land. However, rumor has it she is fed up with Jhudora – her arch rival – and decided that Meridell would be an excellent place to stay. But perhaps she wanted some peace and quiet and Meridell offered it. She offers you to do a quest for her, as she is unable to leave her glade, in return for some rare and exclusive items. You politely decline saying you might come back another day. You say goodbye to Illusen and thank her for her hospitality. After another exhausting climb down, you once again head to the road and look to the northern hills. You see another group of Neopets waiting in line, and then they roll cheese down the hill! Why, this must be Cheese Roller! 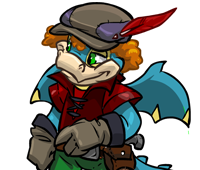 You notice that these Neopets already bought their cheese, so you walk over to a little dinky shack and a Techo greets you and welcomes you to Cheeseroller, and explains the instructions. All you have to do is, well, roll a cheese down a hill. Who would have guessed? Anyway, you can pick your cheese from Spicy Juppie Cheese to Bubbling Blueberry Cheese to brick! Once you purchased your cheese and your turn is up, you have sixty seconds to roll the cheese down the one hundred twenty-meter hill! And if you make it under sixty seconds, you can take the cheese home with you. After your nice quick run down the slope, you look to ahead to a farming village. After a lovely brisk walk, you meet some Scorchios, Gelerts, Aishas, all welcoming you to Meri Acre's Farm! Meri Acre’s Farm supplies the kingdom’s fruit and vegetables, and contains some fun games for tourists! So why don’t we look into some of the activities that some of Neopia's greatest farmers provide? As you progress into the farming village, you look around to see what intrigues you. You notice a big, and by big it’s actually an enormous Marrow! How in Fyora's name can they make them that big? This must be Guess the Weight! The Wocky here, obviously the caretaker of the farm, greets you and shows you to the day's biggest Marrow. Wow! You never seen such a big Marrow before! The Wocky asks you how much you think the Marrow weighs. Can you figure it out? If you get lucky, you might win a rare prize! After an unfortunate failed guess at Guess the Weight, you browse around the farm, greeting one after the other. You cross the road and see a Kacheek counting his potatoes. What could this be? He stands up and welcomes you to Potato Counter! The Kacheek's rules are easy: simply count all the potatoes before you. If you’re able to count quickly under pressure, you just might be able to walk away with a prize! If not, well, you could always try again a different time. So step right up and make your guess to the Kacheek! After you finished your counting (and you still see potatoes when you blink), you find yourself yearning to know more about Meri-Acres farm. Thus, you decide to go to the big field with plenty of bushes. You notice that Neopets are picking their own berries! Why, this must be Pick Your Own! The Gelert greets you kindly and shows you around his twenty-acre farm. All you need to do is pick just one berry in each acre until you have six berries, and then you can walk away and feast upon your harvest. Some berries are more common than others, so how many different kinds of fruit do you think you can get? So, after traveling the many acres of the farm, you realize that you have seen everything there is to see. Fortunately, you’ve heard that King Skarl has been letting people visit his castle, so why not take a visit? To the Meridell Castle! Two Draik guards open up the large castle door and you enter. You can feel the soft red velvet carpet beneath your feet, and you gaze in awe seeing dark blue and red walls, gold trim and statues of famous Meridellians, namely King Skarl. Proceeding in the castle, you notice a large Skeith with a large sum of Neopoints, stacks of them throughout the room! Snargan counts greedily, with visible two black teeth. This must be Double or Nothing! Snargan finally notices your presence in the room. He says that if you bet a measly ten Neopoints, it could turn into hundreds of thousands of Neopoints! So why not? Click the coin, watch it flip, and see if you can make a fortune (or lose your money to the Meridell treasury, either or)! After some not-so-good luck with Snargan, a green Grarrl Guard tells you that King Skarl is grumpy and he wants to be cheered up! Wow! Just your luck! First time in Meridell and you get to see the King. Well, it appears it’s time to play Grumpy Old King! Q: When doesn't you stop a team of disco Babaa unlike decides to avoid of Chomby & the Fungus Balls? Well that's not nice! No wonder he's angrier than before! How could you do that? Fortunately, you’re able to escape the dungeon. Though if you’re willing to come back and do a good enough job, you might walk away with an avatar or two. Leaving the castle, you make your way back to the hilltop where you began. You walk away from Meridell, hopefully happy from your experiences here. Where will your adventures take you next? Wherever you may go, always know you’re welcome back here in Meridell!